There are times when you may want to get a copy of a handwritten document online. One of the most common reasons for somebody to do this is to convert handwritten material into text form like Word document. However, before you can have your handwriting converted to Word, you must first get a copy of your handwriting online. The question then is how are you going to do that? To convert handwriting to Word document. it needs to be in a digital format. It is much easier to do that than you might expect, and there are several ways to go about it. You may already have all the basic essentials necessary for at least one of the methods. Use your smartphone – Take a picture of the handwritten document with your smartphone camera. There are several smartphone apps available that will tag the document photo, making it searchable. Your smartphone functions as your paper text to handwriting converter online capture device. Document scanner – You can use a document scanner to scan handwritten documents onto your computer or onto a flash drive. The higher the resolution that you scan with, the better the chance of getting an accurate Word document when you submit it to a handwriting to text converter online service. Use a smart pen – Smart pens produce both a handwriting paper version and a digital handwriting version at the same time during the writing process. The smart pen has to be used with a special “dot” paper when you write. As you write on the paper the pen also produces a digital version of what you are writing and stores it in its memory. Synchronize the smart pen with your smartphone, computer or tablet to get your digital handwriting copy on line. Tablet and stylus – Graphics tablet and stylus combos work as well with handwriting as with drawing. Windows 8 built-in writing recognition will even convert your handwriting to a text format although it may require training for accuracy. After capturing your handwriting online in digital form it can be sent to a handwriting to text converter services like the one our company provides to be converted to Word or another editable format. So if you need to convert handwriting to Word document, get in touch with us right away! People are constantly having to convert hand written notes to a Word documents. This is not a problem when you have a couple of pages that need to be written in Word. You just sit down at a computer, open Word, and type a copy. It won’t take long at all. However, what if you have several notebooks full of handwriting that you need in Word? It isn’t unusual in the field of science for researchers to take handwritten notes, and some research may have taken years. Journals that cover several years could easily fill a dozen notebooks or more. Most people aren’t too excited about the prospect of having to type hundreds of pages of handwritten material. There are services that do convert handwriting to Word document, and it may be the best choice for anything more that you care to take on yourself. Handwriting to text conversions uses a technology known as OCR (Optical Character Recognition) that uses software to translate handwriting to text. Digitize your handwritten material. You will have to either scan your documents or take digital photographs of the documents so that your handwriting is in digital form. 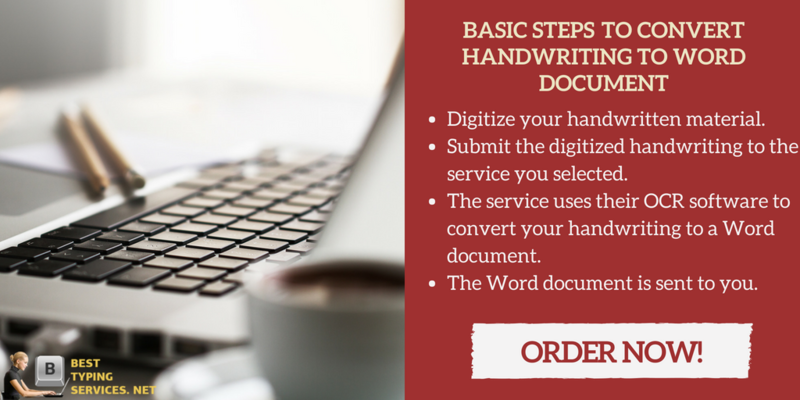 Submit the digitized handwriting to the service you selected. The service uses their OCR software to convert your handwriting to a Word document. The Word document is sent to you. When you need handwriting to Word conversions, hire our typing service for the most accurate handwriting conversions available! Unfortunately, due to the many variations in handwriting and other factors such as writing that is faded or blurred, OCR isn’t completely accurate. You will still need to proofread and edit your Word document if you want it to be accurate. Another alternative is to convert handwriting to Word document using the service we provide. Help with handwriting 24/7 and a courteous customer support always available to address any questions or concerns. Contact us when you need a handwriting to text conversion that is accurate and affordable!